Originally an aspiring novelist who skipped class in college to instead go to the movies, so far acclaimed Japanese writer/director Hirokazu Kore-eda's filmography has largely consisted of intimate family and relationship dramas that could best be described as novels on film. Drawing more upon his love of cinema than fiction, Kore-eda's Film Noir infused legal title The Third Murder marks a bold and (regrettably) largely unsuccessful departure from the fly-on-the-wall docudramas that have become synonymous with his name. While collaborating with lawyers and legal advisers on his masterful Cannes Film Festival award-winning drama Like Father, Like Son, Kore-eda was struck by the Catch 22 revelation that – in spite of our romantic notions about the law – in the end, the court is there to pass judgment and not determine the truth. 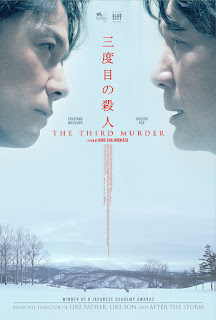 An existential take on our flawed justice system as well as American courtroom dramas and crime pictures of the 1950s in particular, The Third Murder is as fascinating as it is infuriating. Relying on a classic genre hook to grab our attention, Kore-eda introduces us to a cool-headed lawyer who comes to suspect that, despite confessing to murder, his client just might be innocent. Referencing the events of an entirely different murder case involving the exact same man set thirty years earlier while we're still trying to get our bearings in the present, Murder needlessly confuses viewers to the point that a friend and I actually had to stop the movie twice to try and process just what exactly was going on before we'd reached the end of the first act. Hoping to supply the film with the genre requisite number of endless twists, each time the lawyer played by Masaharu Fukuyama (who serves as the viewer's surrogate) thinks they've begun to learn the truth about what really happened on the night of the crime, his client (Kôji Yakusho) backtracks and changes his story an infinite number of times. Growing increasingly ridiculous as it continues, rather than develop his purported Hitchcockian “wrong man” narrative into a successful dramatic thriller that also proves his thesis about the double-edged sword that is the law, Kore-eda appears to lose interest, ultimately throwing everything and the kitchen sink at the screen to see what sticks. And in the process, the film wastes what could've been a very effective dramatic conflict concerning the lawyer's relationship with his father (Isao Hashizume), who coincidentally served as the judge on his client's case thirty years earlier. Of course logically, this alone would probably have forced the lawyer off the case for the sake of appearances (if not outright ethics concerns), it's easy to overlook the contrivance since it leads to some powerful moments of debate between the two, which in any other Kore-eda drama would have become the film's central conflict. Recognizing that, The Third Murder switches gears yet again as the writer/director adds a half-baked mystical component to the storyline. Ponderous, pretentious, and overly long (by at least twenty minutes), The Third Murder raises far more questions than it offers answers, which could have gone a long way towards proving his point about the shortcomings of a system that decides the rest of a person's life or death in the blink of an eye, had so much of the film not been fashioned like a whodunnit. Helping keep us interested beyond our sheer narrative curiosity, Murder's strongest selling points lie in its first rate Noir components in the form of Italian composer Ludovico Einaudi’s hauntingly minimalist score and Mikiya Minamoto's mesmerizing cinematography. Visually inspired by Michael Curtiz's Mildred Pierce and filmed in CinemaScope, Minamoto's inventive juxtaposition of shadow and light yields some absolutely stunning close-ups and richly symbolic shots. With faces overlapping during key points to link our characters and their plights together, the stellar combination of Einaudi’s score with Minamoto's unique visuals create a fascinating subtext which bolsters Kore-eda's otherwise odd blend of existential philosophy, magical realism, Film Noir, and legal drama. But with so much going on, rather than enrich the work, most of the the film's individual layers and subplots are spread so thin that all they do is call attention to themselves. A meandering tour of a lot of otherwise great ideas, The Third Murder makes you wish for the first time in Kore-eda's career that instead of a mishmash literary film, he'd written a film-like novel instead.